And the first official pictures are finally out! Deepika Padukone and Ranveer Singh posted their wedding pictures on their respective Instagram pages. Don't they look lovely? And totally besotted with each other! The bridal couple complements each other perfectly in white and red outfits designed by Sabyasachi Mukherjee. 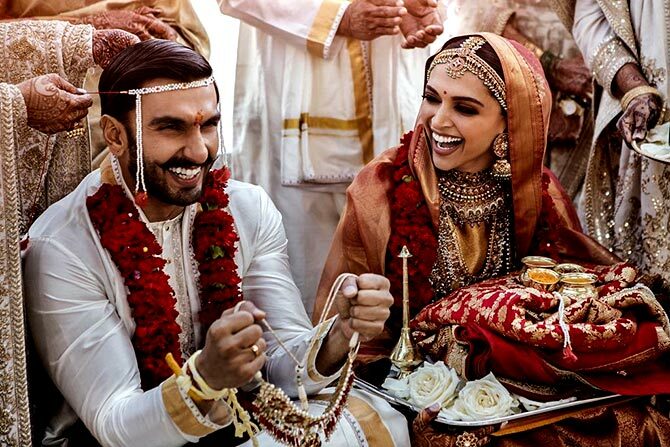 Dips and Ranveer make a memorable picture at their wedding according to the Chitrapur Saraswat Brahmin traditions on Tuesday. The bride wore a red and gold silk sari with a heavy matha-patti, jadau jewellery, jhumkas and smoky eyes while the groom chose an off-white and gold dhoti-kurta with a mundavli. On Wednesday, the couple got married according to Sikh customs in the Anand Karaj ceremony. 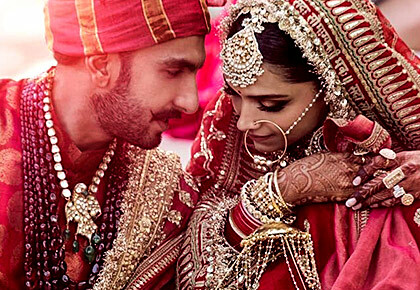 Dips wore a red lehenga-choli, with a heavy maang teeka, a nath, traditional chooda and kalire, while Ranveer wore a red sherwani with a matching saafa. Deep-Veer got married at the Villa del Balbianello. overlooking the beautiful Lake Como in Italy. The wedding was a fiercely private affair, attended only by family and close friends. And the first reactions are already pouring in.